What a difference a year makes. As I reported back in September, 2011 was the worst year in mortgage lending since 1995. Just 365 days later, we experienced the best year since 2007, according to data from Lender Processing Services, yet another sign things are getting back to normal. In 2012, loan origination volume increased 34% year-over-year to 8.6 million loans, up from 6.4 million a year earlier, per the company’s 2012 December Mortgage Monitor released today. Much of the volume increase could probably be attributed to the record low mortgage rates on offer for much of 2012. In fact, rates on the 30-year fixed were below 4% for much of the year, making it nearly irresistible for just about anyone who could to refinance. While volume was up, it still pales in comparison to lending levels seen as recently as 2007. Sure, origination volume from 2005 to 2007 was absurd, but we’re still below historic levels, even with the latest uptick. Also note that the share of government-backed originations was 84%, which while very high, is down from 91% three years earlier. But we’ve still got a long way to go to get closer to a healthier mix of government and conventional mortgages. Fortunately, rates remain low and are expected to stay near current levels, meaning plenty more borrowers will be tempted to refinance or purchase new homes. LPS believes an additional 2.6 million loans may be eligible for HARP under current guidelines. That’s more than the current total of completed HARP loans, which is around two million at last glance. And if HARP 3 or reHARPing or whatever they want to call it comes along, millions more might become eligible for a high loan-to-value refinance. Additionally, as home prices continue to rise, more borrowers will become eligible for traditional refinancing as their levels of home equity rise. Apparently about four million loans with non-conforming LTV ratios may now qualify for a mortgage today. 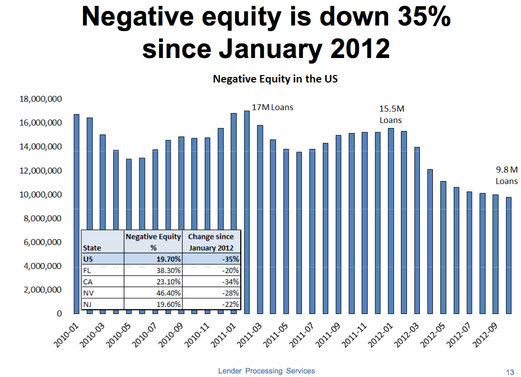 The report indicated that negative equity is down 35% since the start of 2012, though sand states continue to struggle with a large number of underwater loans. Still, the company noted that nearly 20% of mortgages have “refinancible” characteristics. Back in December 2011, 7.2 million loans were deemed “refinancible,” with approximately 5.5 million refinances carried out since. Delinquencies and foreclosure sales have also continued to fall, meaning we may finally be working through all the bad that preceded the housing crisis. So there is certainly plenty to be excited about in 2013, despite a forecast for an overall slowdown in volume. LPS also investigated the potential impact of the recently released qualified mortgage rules. They noted that at least two percent of 2012 originations would have been designated as “non-QM,” compared to 23% back in 2005, when option arms and interest-only loans were king. So basically the QM rules just solidify the direction of mortgage underwriting over the past several years, and don’t really inhibit it. Again, this should all make for a healthier housing market going forward, that is, until the next round of “creative financing” rears it ugly head when home prices become unaffordable. Until then, enjoy the ride up.